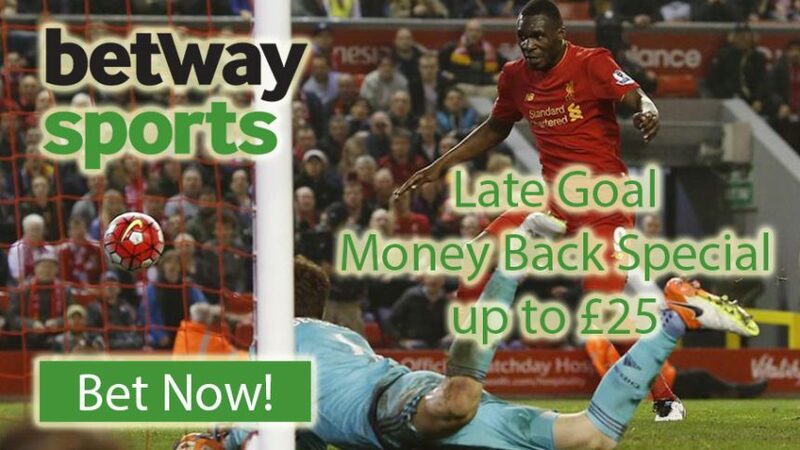 Bet on any Premier League match this weekend and if a player strikes a goal late in the game, online sportsbook Betway will give you up to £25 with the Late Goal Refund. Make a wager of £5 or more on any match for the very last round of the Premier League, and if a goal is scored after 84:59 in the game you’ll receive the Late Goal Refund. This offers applies to the following markets: Correct Score, Scorecast, First Goalscorer, Anytime Goalscorer and Last Goalscorer bets. The Late Goal Refund is valid only for the final round (38th) of the Premier League, which takes place this Sunday (May 15) at 15:00 BST. Before the season is over for good, you have one more chance to cash in on Premier League bets with the online sportsbook Betway. And don’t forget to use the Late Goal Refund in case a player scored after 84:59 in the game. Arsenal will play Aston Villa at the Emirates this weekend, and the hosts could still achieve a second-place finish on the table, if Tottenham lose their encounter against Newcastle away. Online sportsbook Betway strongly favours Arsene Wenger’s men 1.15 (2/13), while the Villains are complete outsiders for this match 17.00 (16/1). Newcastle are underdogs 4.33 (100/30) for their encounter against the Spurs 1.80 (4/5), and the best that they can hope to achieve is a draw 3.75 (11/4) against Mauricio Pochettino’s men. But the last round of the English top flight is more important for the likes of Man City and Man United. The Sky Blues are 4th on the table with 65 points, while their cross town rivals the Red Devils are right behind them in 5th position with 2 points less. It’s important for each of them that the other one losses and they win their final game, in order to make it to a Champions League qualifying spot. Man City 1.53 (8/15) take on Swansea 6.00 (5/1) away, while Man United 1.36 (4/11) host Bournemouth 8.50 (15/2) at Old Trafford. Make sure to bet on these games with the Late Goal Refund and get up to £25 from the online sportsbook Betway! Collect up to £25 with Betway’s Late Goal Refund!